We’ve talked about Consolidated Zinc (ASX:CZL) before, highlighting its potential as the small zinc explorer with high grades. We’ve taken you through some of the encouraging drilling done to date and the economics at work at its flagship Plomosas Zinc Project in Mexico which make CZL such a promising player. In fact drilling at its Tres Amigos site continues to identify high grade mineralisation up dip and along strike from initial intersections. However, the news that is giving shareholders something real to hold onto is that with a whole stack of drilling behind it, CZL is now within its JORC window. Within a month, CZL may very well have a JORC resource ready to report to the market – which could confirm the company as one of the more promising zinc plays to hit the ASX in recent years. And with a successful AU$3.5M oversubscribed capital raising completed, including a $2.2M drawdown facility, CZL is giving shareholders a lot to think about. However, this is a junior exploration company, and all the natural caution should be applied here if considering CZL for your portfolio – this is a speculative stock. The news keeps coming, and it is possible that CZL has found yet another horizon to explore – the Main Manto Horizon , which would potentially expand the resource at its flagship project. 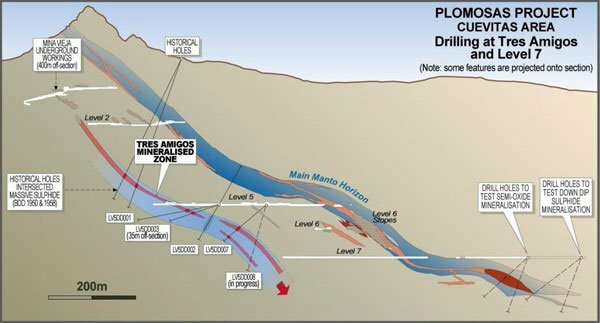 Three underground drill holes have been completed from Level 7 testing the down dip extension of the Main Manto Horizon and assay results are imminent. As this won’t be included in the JORC or scoping study, it could yet provide even more blue sky potential for the company. For those of you coming late to the story, we’ll go through what it’s looking for and tell you why CZL is shaping up for a strong year in 2016. What you need to know is that this canny outfit is setting itself up as a high-grade producer – ready to pull the rug out from under other bigger zinc players. 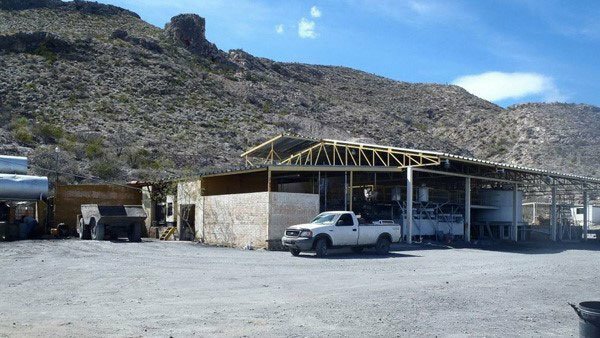 Consolidated Zinc (ASX:CZL) is chasing zinc with an average grade of 15.3% at this stage, but new drilling is happening all the time – helping narrow the range of grades. Taking 15.3% as a rough and ready guide though, you can see that little ol’ CZL with a market cap of just over $12.5 million is ready to take a shot at zinc superstardom. Way out in front of the pack, along with Red Dog in the USA. 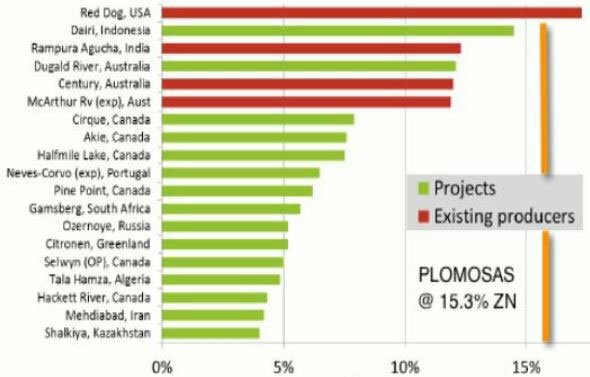 CZL is focused on the Plomosas project in Mexico, after narrowing the portfolio down from its days as New Era Resources. It has a 51% stake in the project, but it is likely to bump this up to 80% as the project gets closer to production. The mine has a bit of history in the country, having been mined in several stages in the past down to about 270m below surface. Historical zinc production has reached about 2 million tonnes of ore with a zinc and lead grade averaging a whopping 22%, along with a cheeky 2 ounce per tonne of silver. 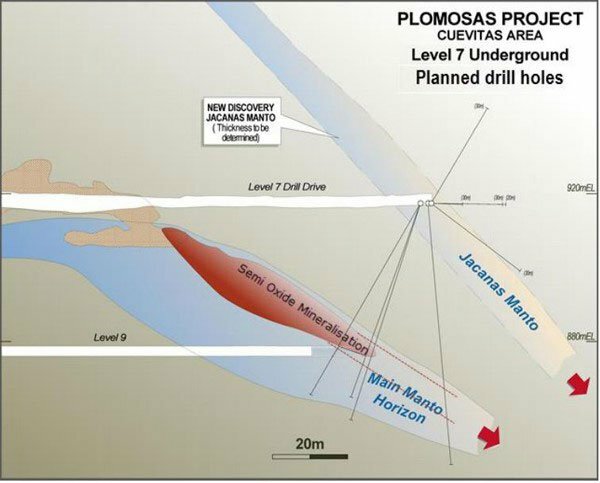 CZL’s play, however, is to tap horizons below the 270m level to get what was missed in the early mining history of Plomosas. The early work has suggested that there could be plenty that was missed due to a mixture of zinc prices at the time and exploration technology not making deeper exploration viable. As you can see from the above, it has two main priorities in mind. 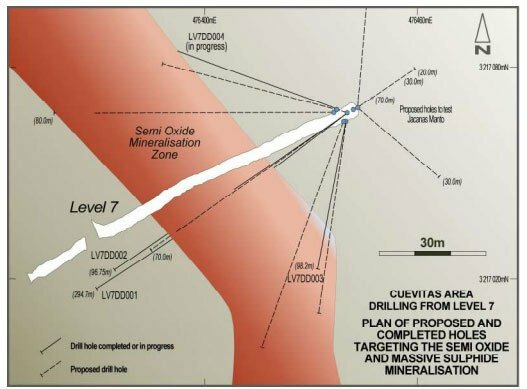 The Main Manto horizon has been the one most historically tapped, but CZL is willing to bet with the drill that it continues beyond what is termed ‘Level 7’ – an area where past explorers had to stop because it wasn’t viable to drill that deep. In fact CZL recently established the first drill position in Level 7 and has just completed underground drilling to test the Main Manto Horizon below Level 7. What drilling has found is a thick high grade zone. Preliminary results for LV7DD002 are 6.75m at 27.2% Zn, 12.7%Pb, 60.4 g/t Ag. Keep in mind that this is a conservative zinc grade as 4.50m assayed >30%Zn and needs to be re-assayed. 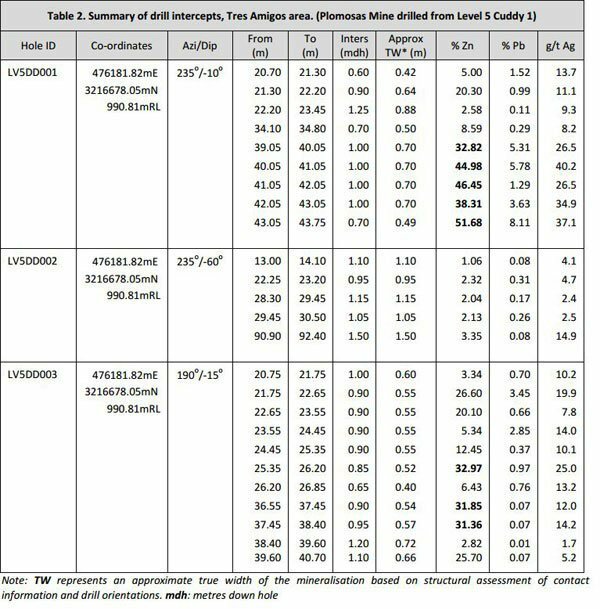 The grades are conservative estimates because five samples over 4.5 million of the 7 samples taken from the intercept returned assays over the maximum detectable limit of >30% Zn and need to be re-assayed using ore concentrate analysis techniques. Those results will be available soon, but to give you an indication of the Level 7 drill collar and drill traces, here’s a visual representation. The new Jacanas Manto Horizon was discovered in the hanging wall to the main mineralised horizon on Level 7 that contains disseminated and stringer sulphide mineralisation. The surface rigs have now returned to site to complete the diamond tails that were collared by RC drilling in December and infill the Tres Amigos drilling for the resource modelling. Meanwhile, CZL has also firmed up the existence of the Tres Amigos mineralised zone, which as you can see from the illustration above hasn’t had a lot of drill holes into it historically. However, some of the grades being found at Tres Amigos have been off the charts. Literally. Some grades have been so high that conventional analysis wasn’t up to the task . All the lab could say using conventional assay techniques was that grades up to 30% had been found. Here’s what a re-analysis, using techniques usually reserved for surveying concentrates found. As you can see, CZL is shaping up as a high-grade wunderkind. Although, it’s still early days here, and CZL need to pass through a few more steps along the way before this play can be called a success – which is no guarantee either. Caution should be exercised if considering CZL for your portfolio. 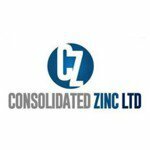 At the early stages of CZL’s work at Plomosas, mining consultants SRK Global were drafted in to give their assessment of the situation based on the drilling and technical work done to date. The consultancy confirmed remarkably high grades of zinc and lead of about 15% to 20%, with silver of about 60-80 grams per tonne. Remember, however, that the SRK work was based on historical drilling which barely touched Tres Amigos. 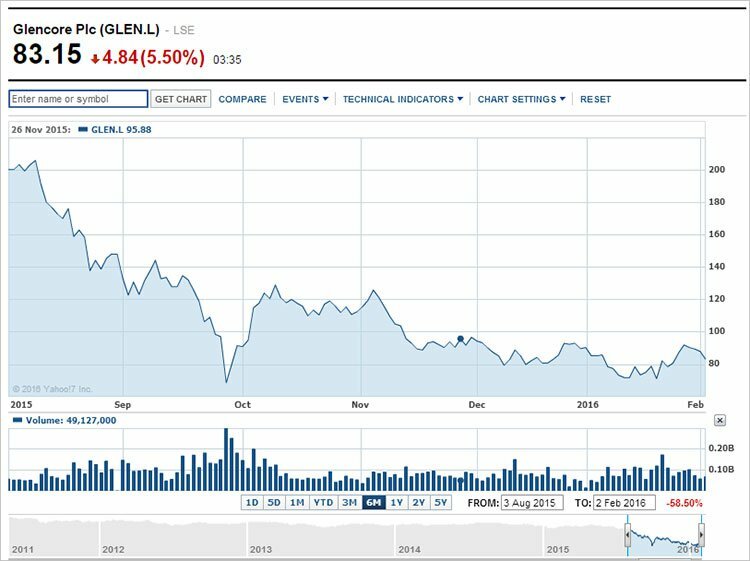 CZL has some grades and promising exploration leads, but where is this all going? This junior miner has an early stage exploration target of 2.9 to 3.2 million tonnes at grades between 15% to 20% zinc-lead, but this all needs to be verified with the drillbit. At the moment, it’s smack-bang in the middle of trying to tie down a JORC resource for the project. Originally the JORC resource was meant to come a little bit earlier in the piece, but CZL kept on coming up with impressive exploration results so knowing what to put in and what to leave is a challenge. Do you go for the earlier JORC resource and risk it being lower than it could potentially be? As you can see, we’re approaching the end of JORC season. The longer play is to get an existing processing facility on site up to a nameplate production capacity of 200 tonnes per day. Below is a shot from the plant as it is today. It was used by previous mining companies for production but has since fallen into disrepair. All it needs is a little TLC work and it should be right to go. If the early exploration work is anything to go by, however, 200tpd won’t be enough longer-term for CZL. Instead, the play here is to get production happening and use the profits from sales to generate more exploration rather than dilute shareholders. It can then use the further drilling to go to a lender and secure funding, and hey presto, CZL is well and truly off to the races. Should CZL be able to prove up more high grade stuff from Tres Amigos and prove the extension of the Main Manto, then we don’t foresee raising that kind of money as too much of a problem. So CZL was recently drilling away at Level 7 of the Main Manto trying to test the extension of the Manto when all of a sudden, it hit a previously unknown limestone unit. The reason why CZL thinks it may be onto something here is because it comprises a marble unit which is similar to that encountered at the Main Manto. Its thinking is that it occurs about 30-40m above the main unit, and at the moment it thinks the unit could be about 12m thick. CZL wasn’t able to test it at the time, but further testing should tell the company what it could have stumbled upon. CZL could end up providing the sort of longer-term development potential banks love to see when deciding whether or not to fund things, like, say, a full-scale processing facility. The good thing though is that CZL is at least cashed-up in the shorter term, so Jacanas can sit there as juicy development potential until the company is ready to come back to it. At the back-end of December CZL managed to snag $3.5 million to new and existing investors with the aim of accelerating drilling at the project. CZL recently announced it had completed a successful capital raising to new and existing investors to accelerate its drilling and development initiatives at Plomosas. It managed to place 28.8 million shares at 4.5c per share with no steep discount. The placement raised $1.3 million, but it’s a $2.2 million potential loan which caught our eye. After shopping around CZL, the company was able to pique the curiosity of Funan Group out of Singapore. This is a deep-pocketed outfit with deep ties to Asian banks, and are experienced with similar resources projects around the world. The boys and girls from Funan will undertake a site visit and a review of the technical data, and should Funan give the all-clear it would be a great vote of confidence in CZL. This is a chart which illustrates nicely why CZL is mining fertile ground (in more ways than one). Well, that’s pretty self-explanatory then. Actually, a bit more explanation is needed. 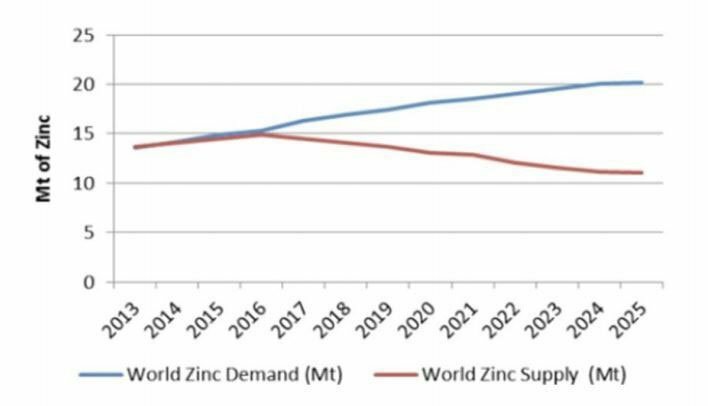 The reason why the world zinc market looks like it’s heading for a classic supply/demand imbalance with a corresponding increase in the price of the commodity is down to a range of factors, but mostly because mines around the world are shutting down. But why would it do that if the zinc market was so robust? Meanwhile, mines such as MMG Limited Century Mine in Queensland are closing as well. But that’s not about economics, rather about the fact that the mines are simply tapped out altogether. There’s nothing left to mine, and that’s led to closures around the world. That’s why there’s a projected supply/demand imbalance in the pipeline, and zinc is one of the few commodities without a supply glut. Morgan Stanley has said that by 2017, more than 1.2 million tonnes of zinc will be taken out of the annual supply pool. One of the key advantages CZL has is that it’s been able to hit a sweet spot full of high-grade stuff. CZL, in this regard, appear well-placed. Mexico itself is emerging as a (relative) economic powerhouse which in recent years has done much to unwind a sometimes hostile environment to foreign companies, especially resources companies. In fact, according to the Financial Times’ data unit , Mexico has become the pre-eminent destination for foreign capital in Latin and South America. According to the numbers, it attracted $33 billion from 366 greenfield projects started by foreign companies in the country during 2014. Elsewhere, Brazil had just $18 billion from 322 projects over the same period. But wait, isn’t Brazil a fabled ‘BRIC’ nation? Shouldn’t foreign companies be falling over themselves to get involved in the growth story? It really does come down to a matter of cost. In fact, did you know that by some measures it’s cheaper to manufacture a car in Mexico than it is in China? Of course, that’s being helped by the scale created by US companies outsourcing manufacturing jobs down there, but that’s another story for another time. Number one, there’s now an abundance of manufacturing skill in the country which could be applied to the mining industry relatively simply. Number two, part of the reason for the strength in Mexican manufacturing is that it is a low-wage environment. CZL can hit all the high grade rocks it wants, but if the numbers ultimately stack up then it’s going to be left with a bunch of shiny rocks rather than the fat profits shareholders are looking for. But once upon a time, a tiny Australian company wouldn’t have even gotten a look in. So why did attitudes in the country change? Back in 2013, when Mexico was about to become a net energy importer, President Enrique Pena Niento decided to open up the energy industry in the country, with foreign oil companies able to compete for new blocks for the first time since 1938. That plan has now stalled thanks to a tanking oil price, but the attitudes on foreign companies looking at resources projects hasn’t. CZL has put together the game plan, and its drilling to date supports its hypothesis that while it can’t compete with the majors on scale, it may be able to come in as a boutique producer and carve itself a market in high-grade ore.
CZL is basically the artisanal hipster coffee shop of the zinc world. Of course, there won’t be much difference between CZL’s ore and the majors’ ore once it’s processed, but because CZL’s grades are so high it will be able to process more ore pound for pound for less money. The higher the grade, the less cash required to bring it up to a saleable product. CZL is smack-bang in the middle of bringing a JORC resource to the attention of the market, so we’ll get a fair idea of what CZL is looking at within a month . We should reiterate here that this is still a speculative stock, and not without risk. It’s always a good idea to seek professional advice and consider your personal circumstances before choosing to invest in a stock like CZL. Very interesting times for the small zinc player that could, and we’ll be watching closely.